"The Beauty of Life," a lecture before the Birmingham Society of Arts and School of Design (19.2.1880), later published in Hopes and Fears for Art: Five Lectures Delivered in Birmingham, London, and Nottingham, 1878 - 1881. 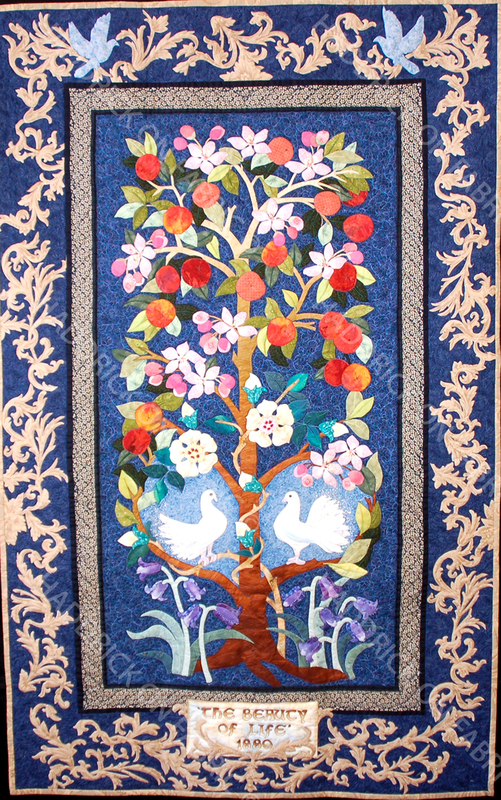 Initially designing a Tree of Life quilt, research led me to the work of William Morris. His printed furnishing fabrics, embroideries and tapestries incorporated many botanical elements and in this design I utilized ideas and some elements from these. I was inspired by his belief that “Every design should have beauty, imagination and order” and I utilized a number of design and visual elements that hold historic, symbolic and personal references for me. The apple tree has long been associated with wisdom, temptation and immortality, as exemplified by its role in the tempting of Adam and Eve in the Garden of Eden. To the Celts, the tree was a source of basic sustenance; a bearer of food, a provider of shelter and fuel for cooking and warmth. It is a plant preferred domestically above many others because when the flowers die, most plants leave a scent. The apple blossom however leads to delicious fruit. I have depicted here the buds, flowers and fruit of the apple tree, with two old fashioned roses symbolising love and beauty as well as the wild hyacinth for kindness. The dove is said to ‘open the gateway’ between the physical and spiritual world, awakening mankind to the promise of the future after life. A pair of Doves illustrated here symbolise this comfort, tenderness and spirit of humankind. Morris's art, his ideals, and his lifework paved the way for generations of artists who followed him in his pursuit of what he called "the beauty of life" In his 1880 lecture 'The Beauty of Life', Morris defined art and beauty together as integral to life itself. The theme I have stitched here represents the act of creating and expressing that is a vital and integral part of my life. I hope this joy is celebrated in my work “The Beauty of Life”.